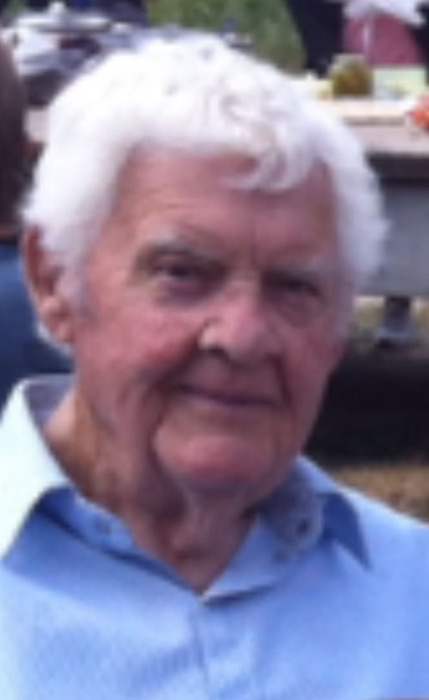 John Samuel Gray, 95, of Hawesville, passed away on Saturday, March 23, 2019 at the Heartford House with his family by his side. He was born in Hawesville on November 23, 1923 to the late Fred and Elizabeth Holmes Gray. John was a member of Patesville Baptist Church and was a veteran of The United States Army. He was a farmer and a former Hancock County Jailer. John loved his chickens, telling stories and his family. He was preceded in death by his wife, Ada Gray, a son, Bro. Sam Gray, a great granddaughter Kimberly Gray, brothers, Frederick, Jim, Frank, Ernest and Jerry Gray; sisters, Catherine Volocko and Hazel Hale; half-brothers, Doris, Paul, Damon and Willie Gray. Survivors include his children, Diana (Dayne) Newton, Carol Gray (late Sam Gray), Jane (Charlie) Jackson, Sandy (Donnie) Young, Carla (Jimmy) Payne, Judy (Gerald) Nugent, and Mark (Tracey) Gray, as well as his grandchildren: Kevin (Michelle) Newton, Cindy (Eugene) Whithworth, Timmy (Jamia) Newton, Neil (Kathy) Gray, Laura (Norman) Fuchs, Stevie Jackson, Johnny (Sally) Jackson, Billy (Natalie) Jackson, Russell (Peyton) Jackson, Glen Young, Jeremy (Crystal) Young, Brad (Ivy) Young, Karrie (Steve) Raley, Cassandra (Jeff) Durbin, Karen (Steve) Robertson, Wes (Vanessa) Payne, Brock Nugent, Amy (Brian) Roberts, Matt (Whitney) Gray, and Austin (Tamara) Gray, as well as several great-grand children and great-great grand children; sister, Sage “Eula” Critcheloe; brother, Grover Gray along with many nieces, nephews and cousins. Services will be held at 1 pm on Tuesday, March 26, 2019 at Patesville Baptist Church with burial in Clark-Young Cemetery. Visitation will be held from 3 pm until 8 pm on Monday and from 9 am until service time Tuesday at Patesville Baptist Church. Memorial Contributions may be made to Patesville Baptist Church.